Shout out to Web 2.0 property colourlovers.com. I wonder if someone will buy that site, or adopt it? Original bold green for Bitesize Irish. Original background-green for Bitesize Irish. It defined the site, by being the omni-present background colour. 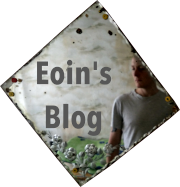 For me, Bitesize Irish is about creativity. It’s for people who are looking to do something with their energy, re-kindling an ancient connection, looking for a sense of belonging. Updated palette for Bitesize Irish. Being a site with a green shamrock doesn’t bode well if you’re in the Irish-abroad market segment. The green shamrock is an overly-used symbol. It’s Christian in its origins (not necessarily a good or bad thing either way). By being a green shamrock, you don’t have a chance of getting remembered unless you’re a company with a bit of money, such as Aer Lingus. I researched a type of Celtic maroon that was suggested to me by a team member. It was an ancient colour of Ireland, it seems. However, it’s hard to make maroon as creative colour that would inspire action. 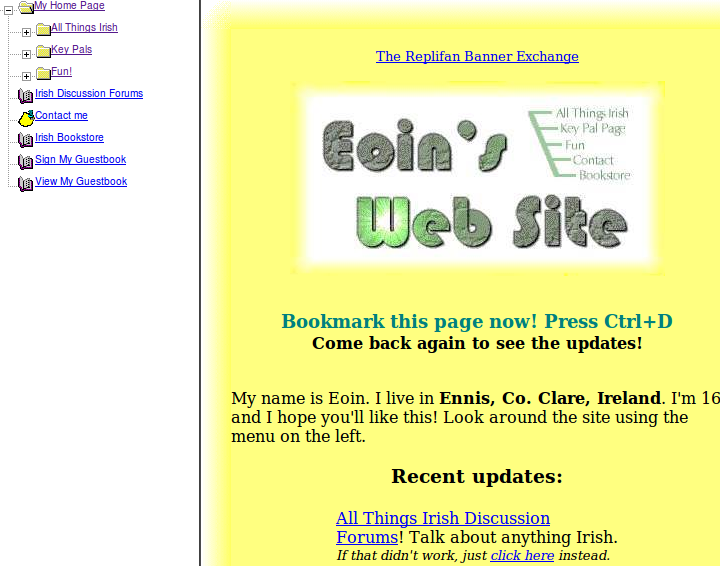 My home page at point point, probably in the late 1990s. Yellow is an inspiring colour. It’s invigorating. It’s a colour that ancient Ireland saw through equinox suns lighting up decorated rocks that still live with us today. Dutch orange is a vital part of Ireland’s history, represented by our country’s flag. This will only get more important to Ireland as we move toward unification of the country, brought on by Brexit. And lastly there’s our daring pink, in the middle of the new palette. It’s there to highlight things that will otherwise go missing. Elements that we need to call out to. You can call this garish or not-so-subtle, and I could possibly agree with you. But what choice are you going to make in this world: to fade into the background, or to use your creativity to make an expression in this world?